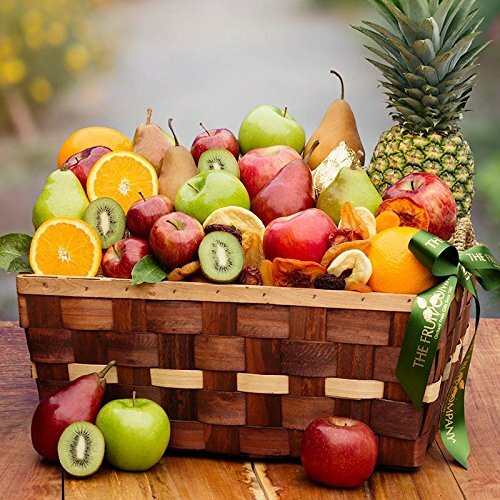 Our Festival of Fruit is overflowing with sweet tropical pineapple, succulent apples, crisp pears and delectable oranges. Launch your own celebration or commemorate birthdays, anniversaries, job promotions, college acceptances and other milestones. Basket Dimensions: 19.25" Length x 13.62" Width x 8" Height Citrus cannot be shipped to California or Arizona due to agricultural restrictions. Pineapple cannot be shipped to Hawaii due to agricultural restrictions. Northwest-grown pears or apples will be substituted. For optimal freshness and quality, or due to seasonality, we reserve the right to substitute certain ingredients of equal or higher value.